UNITED NATIONS, Feb. 20, updated Feb. 21 -- With more than 100 dead in the turmoil in Guinea, on Tuesday in a UN Security Council debate, Canada said that the situation there should be put on the Council's agenda. Afterwards, Inner City Press asked Council president Peter Burian if he envisioned Guinea being discussed before the end of the month. Amb. Burian said that that topic was broached at a luncheon between Council members and Ban Ki-moon, and that now they would wait to hear from Mr. Ban's envoy. Video here. Another Council diplomat, this time from the Permanent Five, clarified that the UN will be assessing the situation, along with the regional body ECOWAS. Two African Ambassadors, however, took a different stance. Amb. 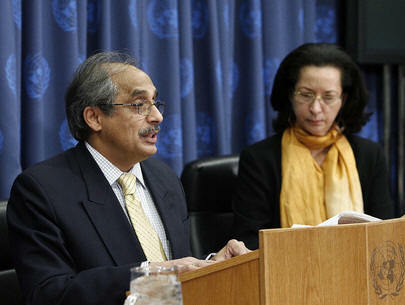 Nanna of Ghana told Inner City Press, "It is too early" for Guinea to be discussed by the Security Council. South Africa's Ambassador Dumisani Kumalo was more blunt. "It doesn't qualify" for treatment by the Security Council, he said. When told that Canada had asked that Guinea be added to the agenda, Amb. Kumalo sighed, "So much for our neighbors." The UN's apparently Sisyphusian efforts to get its peacekeepers into Darfur leads it to stay strangely silent. On Tuesday in Libya, the Darfur-based rebels of the National Redemption Front met with the Sudanese government. At UN Headquarters in New York, Inner City Press asked if UN envoy Jan Eliasson was attending, as at least one article had reported, and if the UN had any comment on the Libyan initiative. Subsequently the office of Ban Ki-moon's spokesperson said that while Mr. Eliasson is not attending, the UN welcomes anything that might help. But why then not mention this Darfur meeting in Libya until asked about it? The same was raised about the UN's silence until asked about attacks on UN vehicles in Kosovo. Two journalists on Tuesday asked the spokesperson about calls on the UN to do something about an asteroid which has a 45,000 to 1 chance of striking the Earth in the mid 2030s. 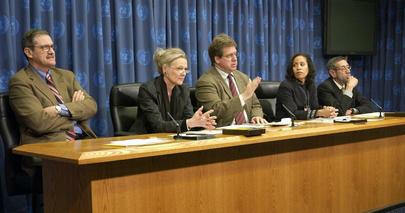 One wag noted, "Yeah, the UN can't get peacekeepers into Darfur, but it can shoot down an asteroid in the future." A listener said, "You are a UN-hater." But that's not true. 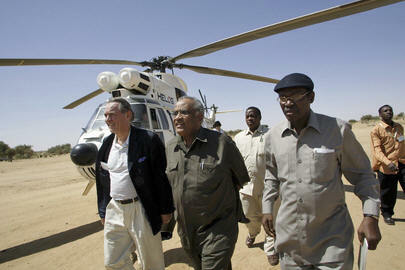 Update of Wednesday, Feb. 21, Reuters again reports that Mr. Eliasson will be at the Libya talks, click here to view. AFP, however, got denials of attendance from both the UN and the AU. Lost in space?